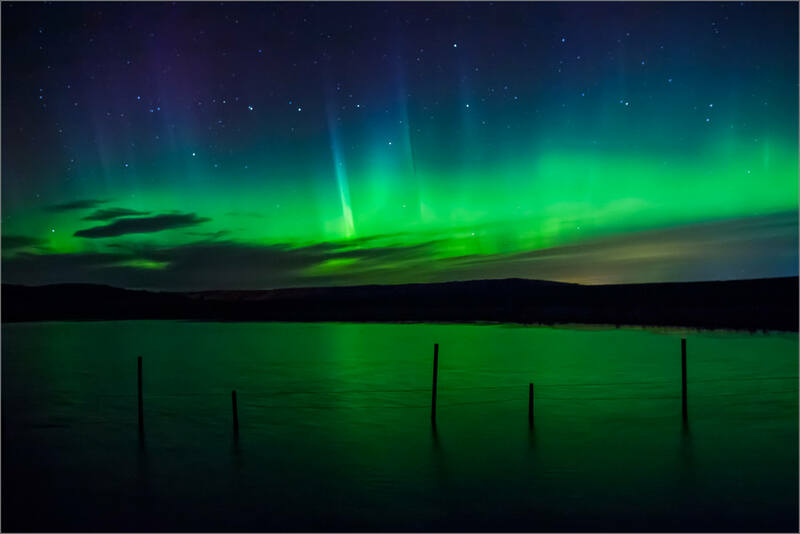 We are in the solar minimum and the Aurora Borealis displays at this latitude have been at a minimum as well. On a night walk last night I noticed a bit of color in the sky. 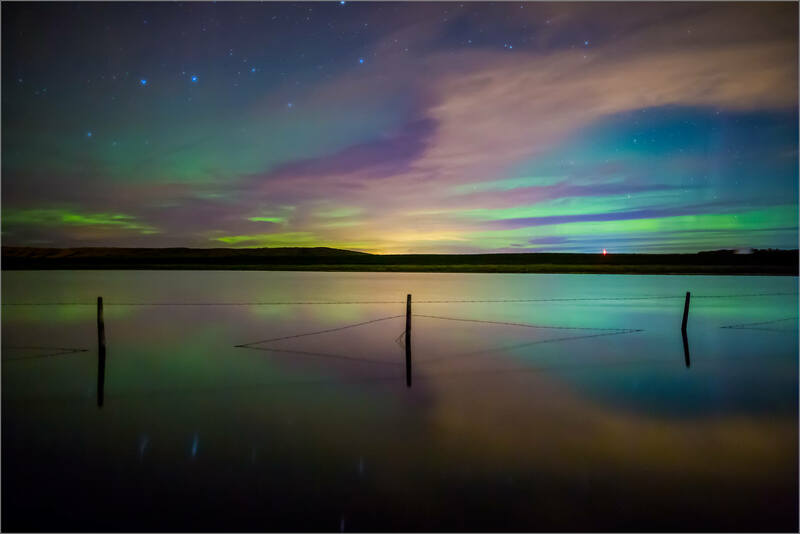 Longer exposures showed a diffused haze of the Northern Lights. Subtle but still beautiful. The quiet show ended quickly. It was very nice to see them once again. As the aurora faded out I needed my headlamp to bring a bit of color to the last photograph. 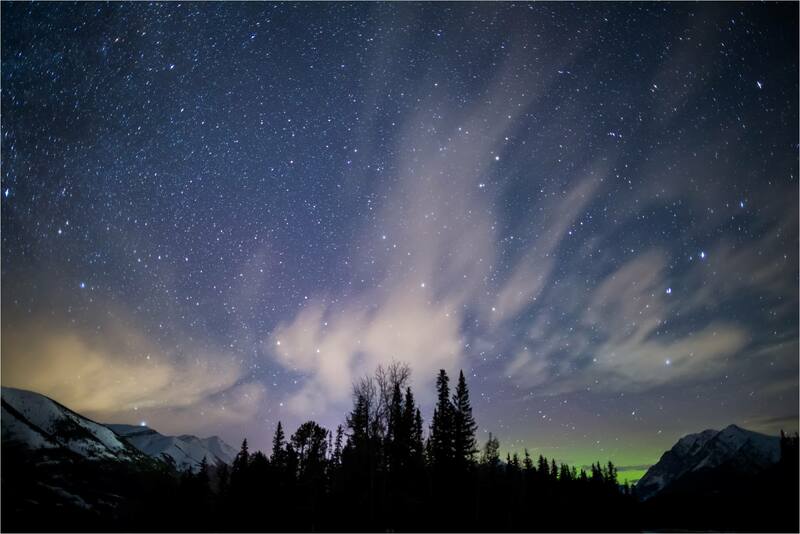 A 25 second exposure and a fast lens (in this case, a Canon 24mm f/1.4 set at f/1.8) revealed wisps of clouds stretching east across the Kananaskis River valley a little after 4 in the morning on October 7th. 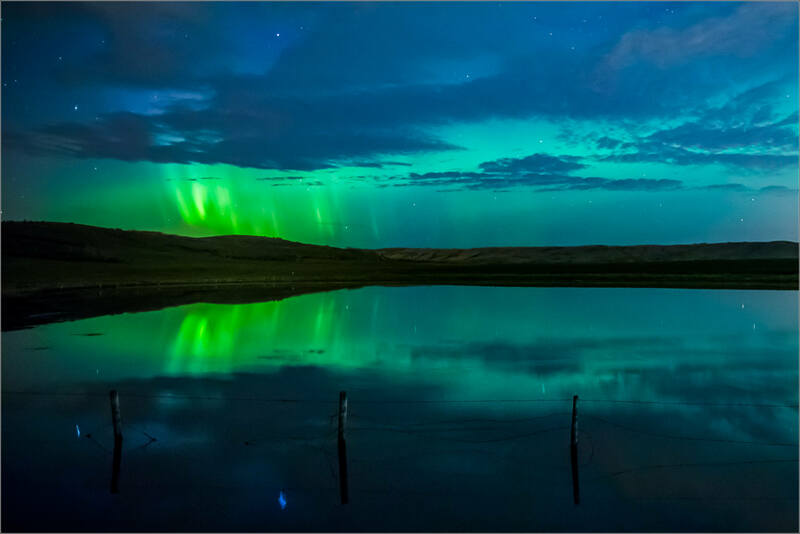 The soft green glow betrayed the Aurora Borealis pulsing low over the northern horizon. Red light from my headlamp illuminated Highway 40 in this 10 second exposure that centered on the hazy Northern Lights. 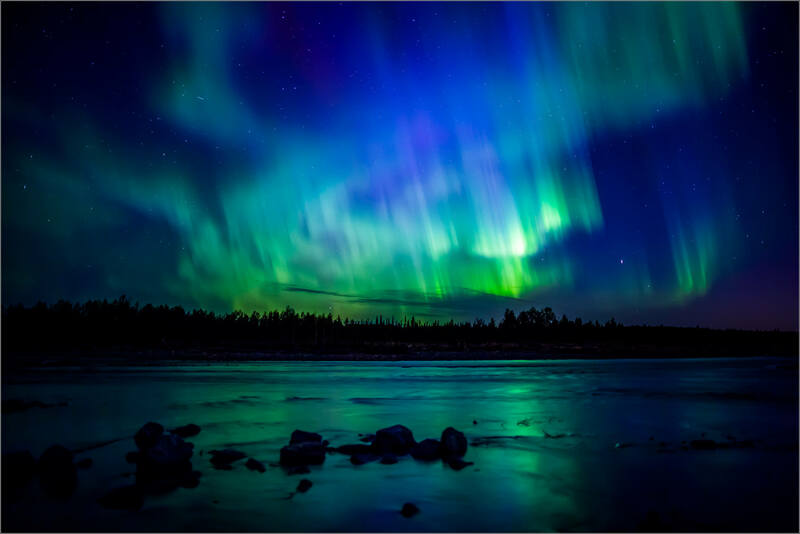 On the weekend there was a minor geomagnetic storm which enveloped the Earth for a couple of days. 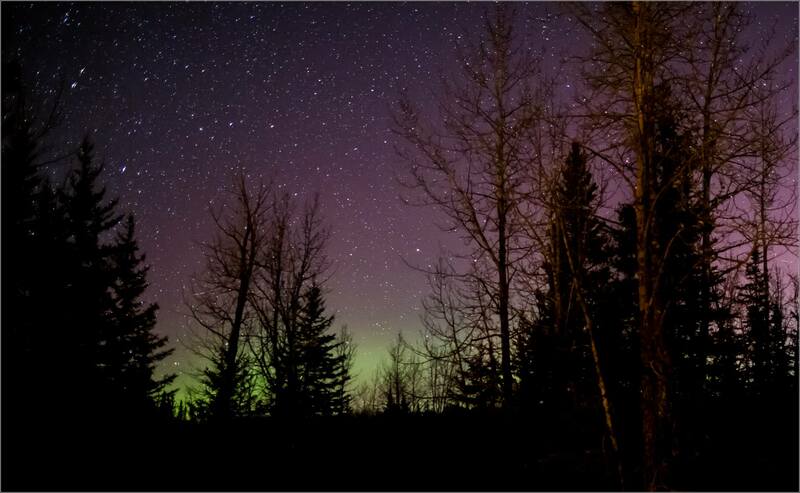 Around midnight on Sunday I could see a green glow along the northern horizon so I walked down to the Elbow River. It runs near my backyard and I was quickly down at the water. A couple of hours saw a few sprites stretch away from thick Aurora band which stayed low in the sky. 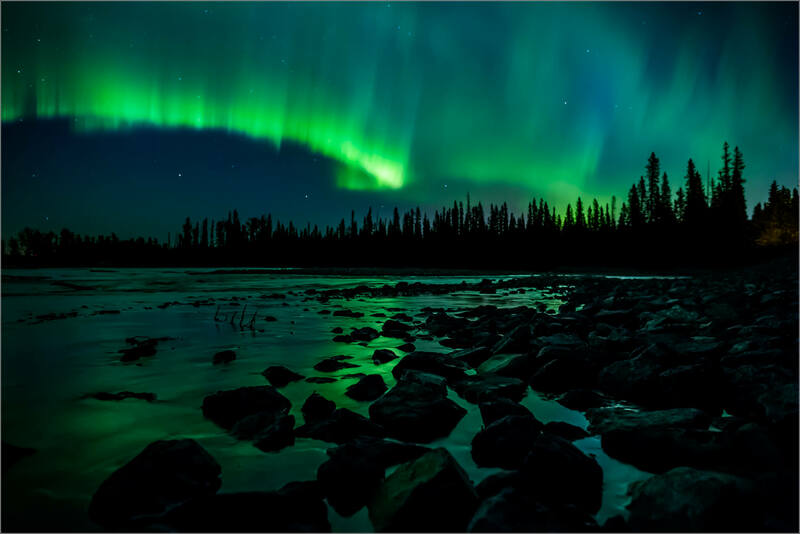 However the Northern Lights were comfortable doing a slow waltz on this night. Next time I’ll hope for a more energetic dance but I certainly enjoyed the quiet beauty that was shared. I walked my dog early this morning and when I looked to the north could see the Northern Lights rippling and snapping above the horizon. The hound was returned home and replaced by my camera. I walked down to the Elbow River which runs nearby and spent a couple of hours photographing the Aurora Borealis before it faded out against the approaching dawn. I’m feeling very lucky to be able to enjoy such a show in my backyard! 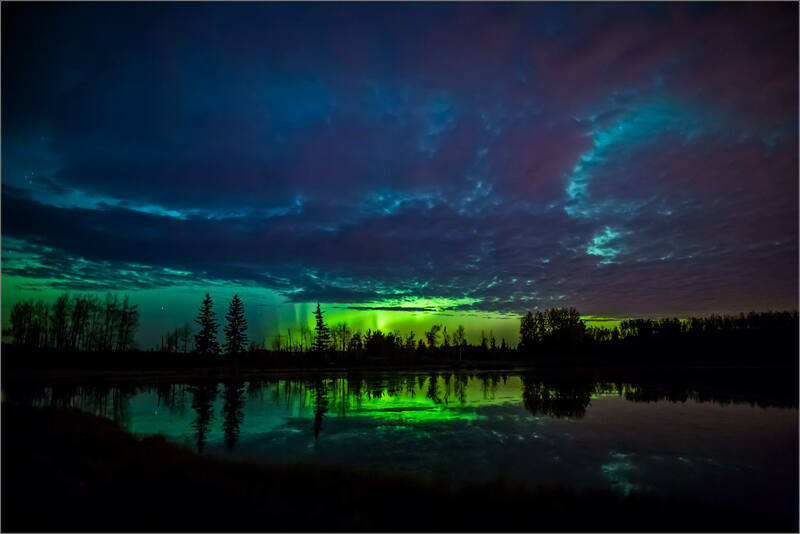 The aurora storms in May were beautiful. This is one photograph from May 20th in Banff National Park along the Lake Minnewanka shoreline. There is a good chance of more displays this weekend. I’ll be looking up and hopefully the ribbons of red, green and purple will be dancing above. Following on from my last post on this geomagnetic storm, here are a few of the images from later in the night. 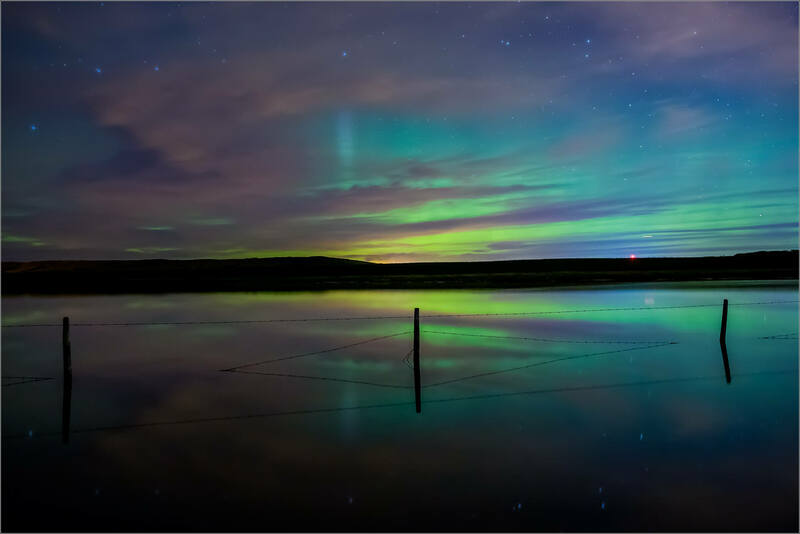 As the early hours of May 21st dripped past, the sprites in the Northern Lights appeared and then alternated with beautiful glowing arches. These continued painting across the sky well past the earliest sign of dawn. The rise of the crescent moon came just after 4 am as the aurora’s glow started to fade and night handed the sky over to day. Within an hour the sunlight brushed its own colors across the canvas now shared with clouds instead of stars. 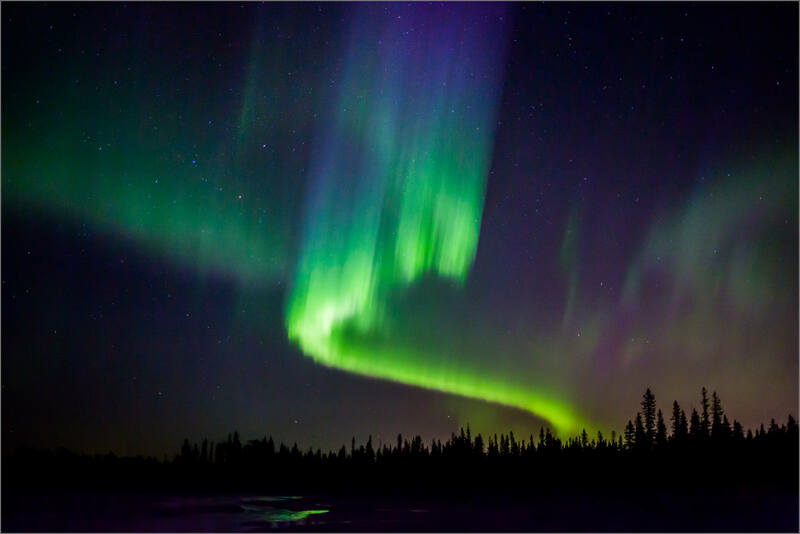 There have been strong Aurora Borealis events over the past couple of weeks. 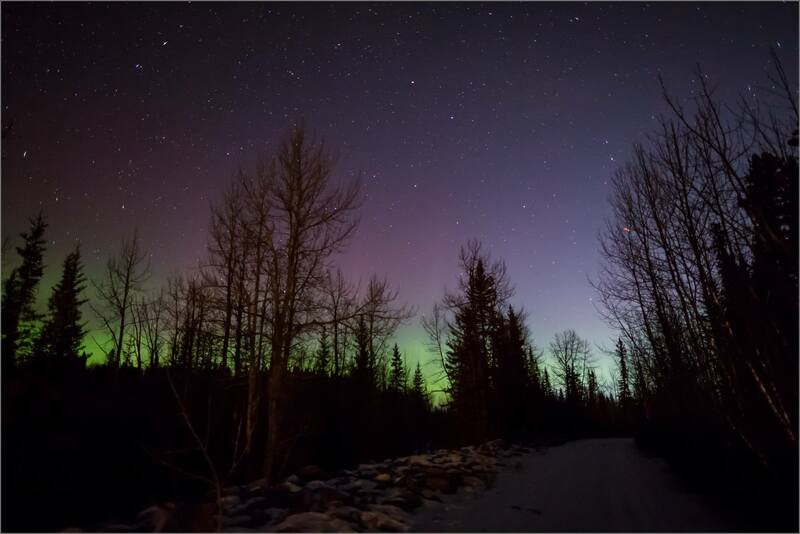 These have extended far enough south that those of us in southern Alberta have been able to enjoy great displays in the night sky. 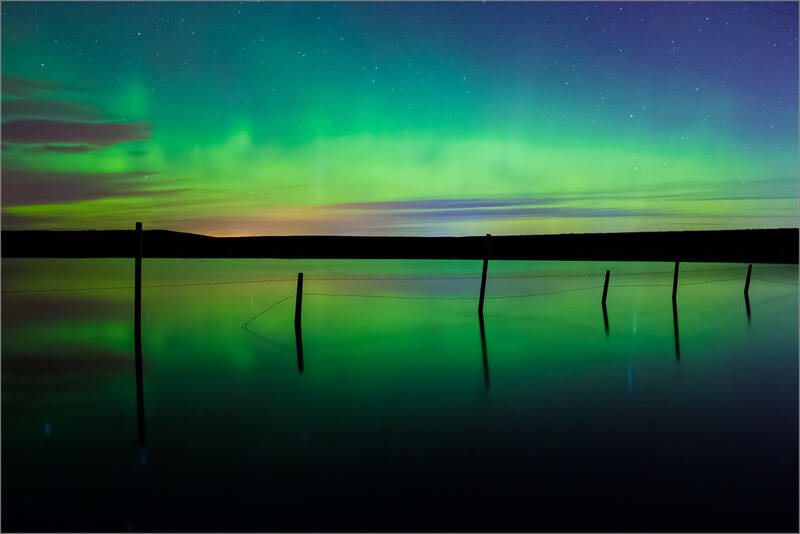 Throughout the earliest hours of May 20th the Northern Lights flashed, rippled and glowed over Lake Minnewanka in Banff National Park. It was a beautiful night with few clouds and a sky that looked like someone had spread out all the diamonds across a dark blanket. 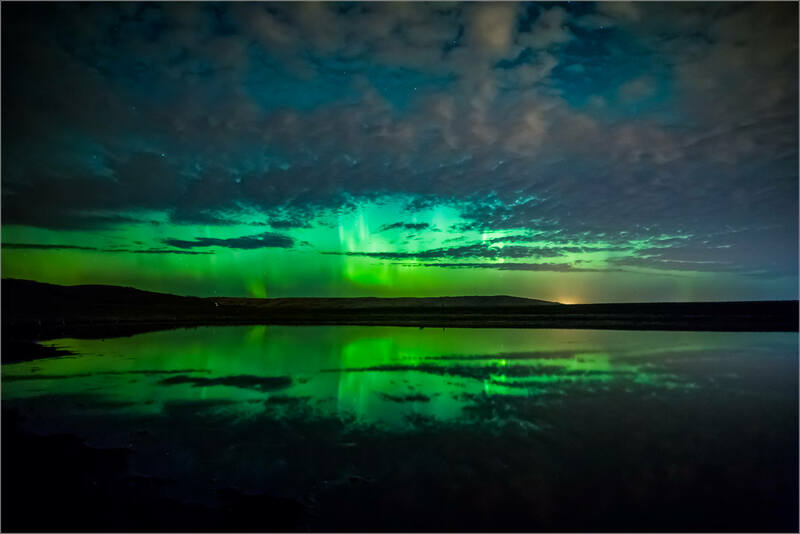 Along the lake’s western shore, many people had come out to see the auroras. When I passed the marina, the storm was in a lull but the green glow drew a sharp line on the Palliser Range’s silhouette. I’m usually alone when I’m photographing at night so it was neat to be part of a loose community all there to enjoy this natural event. Most people were lined up along the dam. I hiked down a trail a bit further south and found a stretch of rock along the water’s edge that looked good to me. 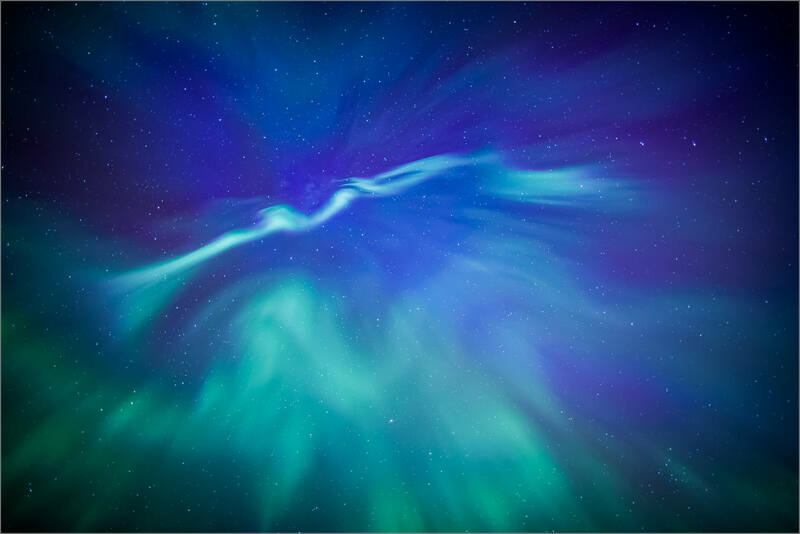 I spent the next four hours watching the sky, scrambling around the rocks and photographing the aurora. The photographs here are from the first hour during an active period following the lull. I will share a few more from later in night in another post soon. Last weekend there was a massive storm in the sky on Saturday night. 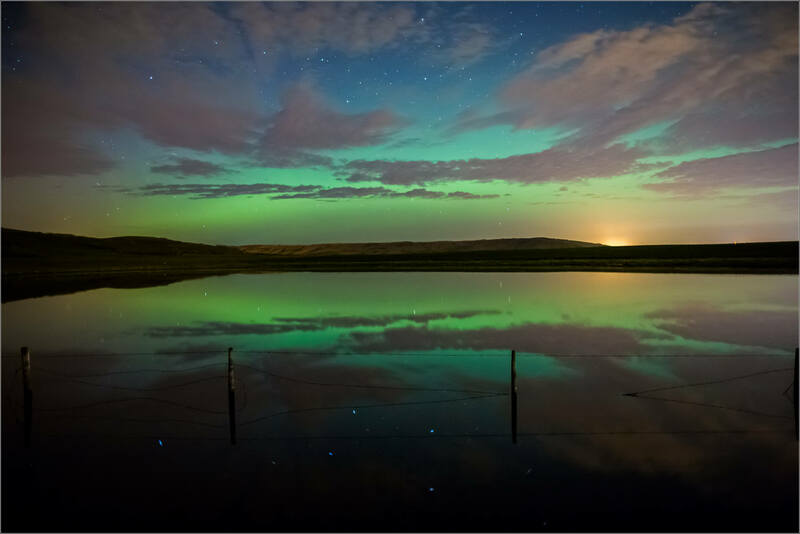 Not the thunder and lightning kind – though there was a very energetic rain shower around 2am – rather a geomagnetic storm. With that came bright auroras which rippled and shot for several hours. The rain actually woke me up and when I looked outside, I could see the Northern Lights between gaps in the clearing clouds. I picked up some gear and headed outside right away. Living near Bragg Creek we have dark skies except for the glow from Calgary to the east so it was easy to see the show right from my deck. When I walked over to the banks of the Elbow River, it coincided with an intense burst that lasted for almost twenty minutes. I woke my daughter up later when I went back home and we were able to catch another smaller outburst – her first in real-time. Easily the best part of a great night. 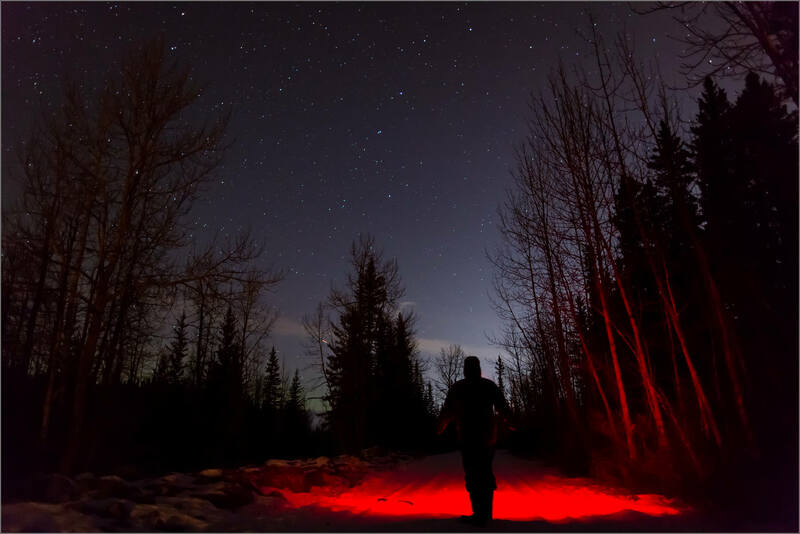 A red alert from the Aurora Watch website late on the 27th prompted me to head north in search of the Northern Lights. I traveled around for a while on either side of midnight – the sky was clear but the lights were very soft. 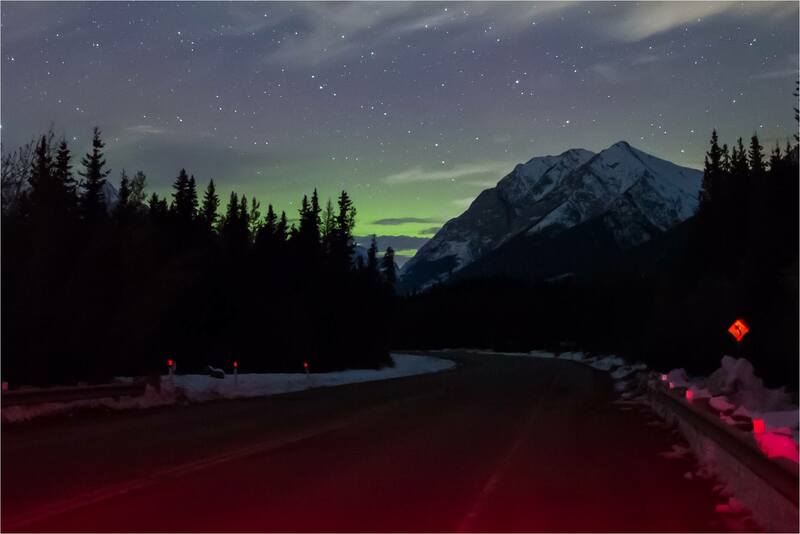 Eventually the sky’s glow began to build and I stopped on Jumping Pound Road south of Cochrane to watch the Aurora Borealis as it rose up. There was a great arch that developed and sprites pulled away at different times throughout the show. 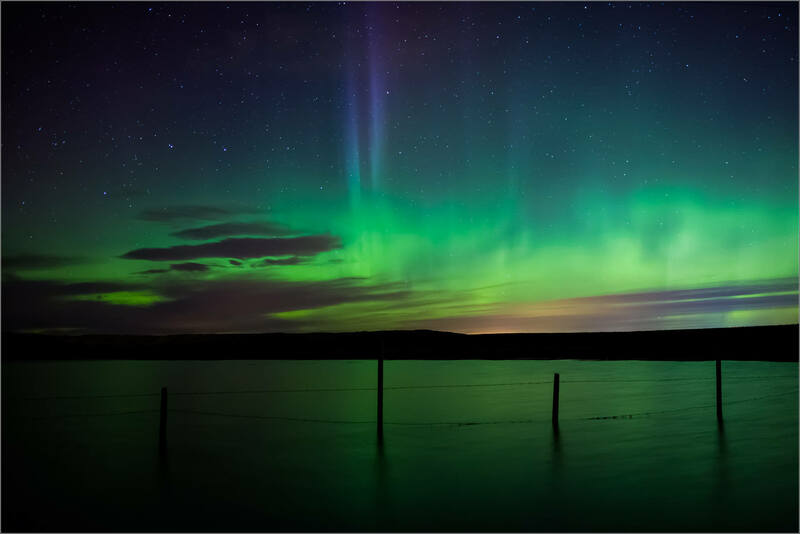 Only three days after I was able to watch a great showing by the Northern Lights, they came out to dance over the foothills again. The clouds were heavier this time around and grew steadily through the night while I was out. That set up for some backlighting by the aurora that looked really beautiful. 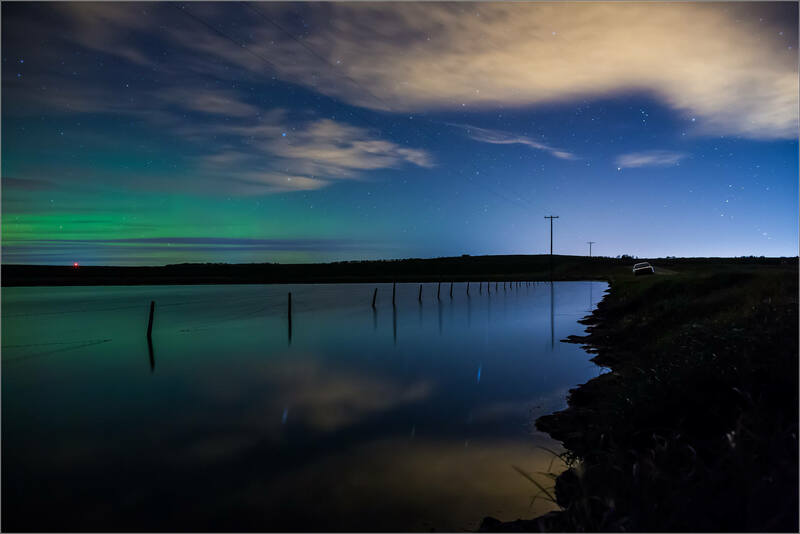 This time around, I started at the same small pond as before but then drive to a couple of different spots along Highway 1 before ending my night at the small lake beside the Sibbald Creek Trail (Highway 68) where it meets Township Road 252. At first I was trying to get away from the cloud bank as it coalesced and then moved southwards and increasingly obscured my view of the night sky. Soon I became a little hypnotized by the glow around and through the clouds so I settled down and enjoyed the moment. After 2am, the clouds broke up and seemed to return back to the north. I was too tired to see how far they retreated and made my way home just before 3. 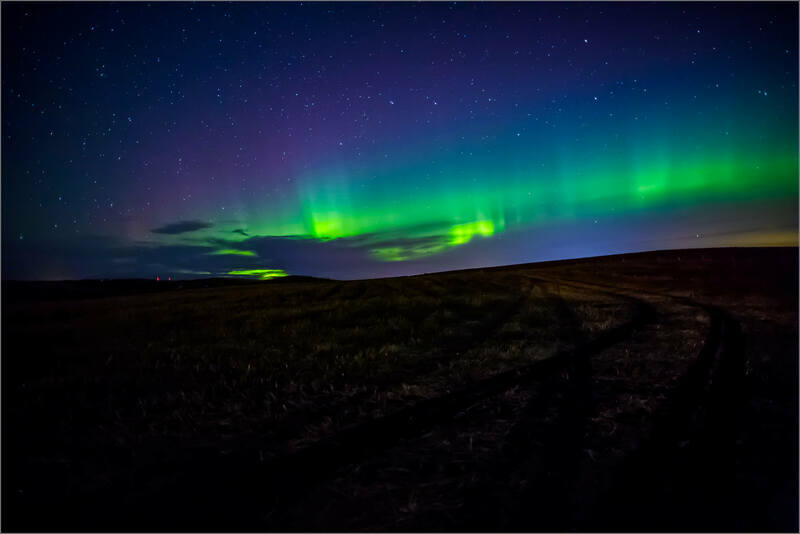 September closed out with several strong Northern Lights displays that reached down to southern Alberta. I was happy to make it out to the Foothills to photograph in the middle of the night for two of them. These images are from the first foray which started around 11:30pm and continued rippling when I finally headed home around 2am on the 26th. 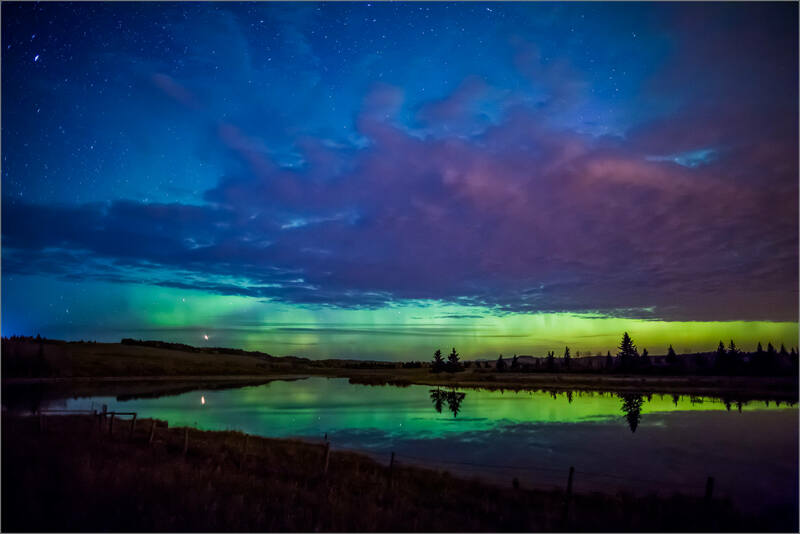 The clouds seemed to move in slow motion and picked up the glow from Cochrane differently as the night progressed. 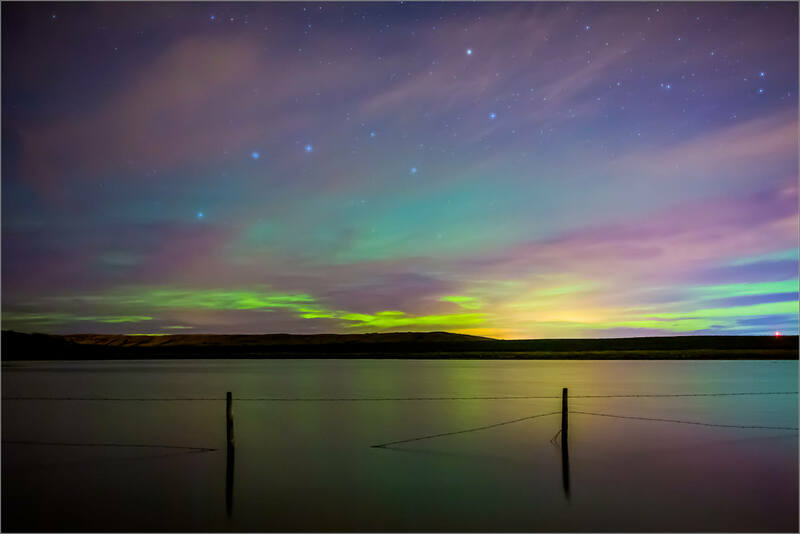 Above, the aurora’s color palette shifted into pastels. A few of the later images reminded me of cotton candy and were fantastic to watch slowly ripple then fade away. I imagined these were tie-dyed waves rolling in both over the pond but also the sky they were reflecting. Ursa Major and its Big Dipper were constant companions in the sky behind the dancing lights. The stars would run in and out of the clouds, hiding at times and burning brightly at other times. There was good magic to watch throughout. 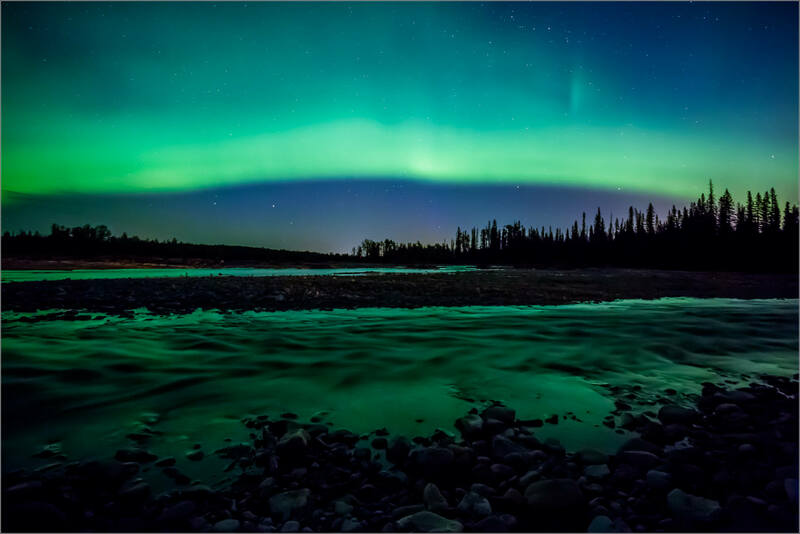 When the Northern Lights brightly lit up the sky on May 8th, I went out to a favourite spot along the Elbow River on the edge of Redwood Meadows. The river there is dotted with sets of rocks near the shore which provide interesting elements and break up the reflection in an attractive way. The landscape is beautiful and supported the main show in the sky above well. 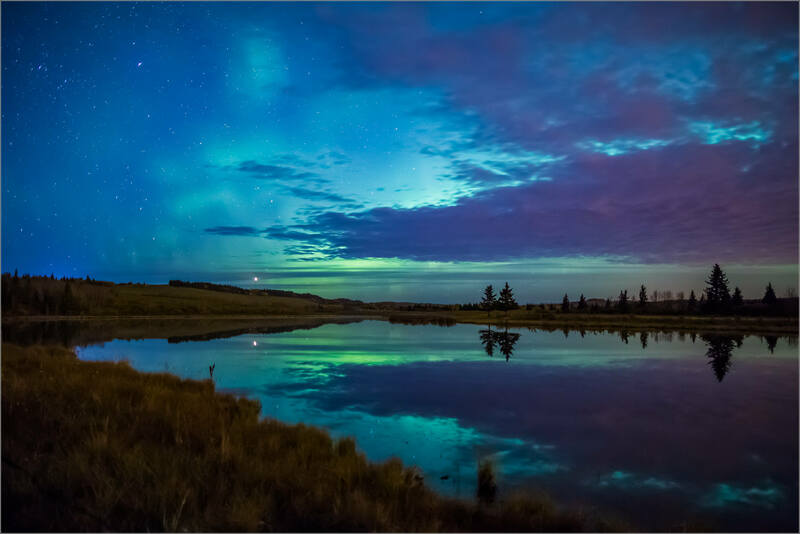 The Aurora streamed across the sky from the northern horizon to well past the zenith. The image below was taken with the camera pointing almost straight up.